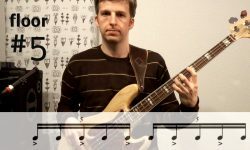 This is part 1 of my series on konnakol, a rhythm language that may help you improve your sense of rhythm. In this first video, I’m introducing the vocabulary of konnakol. It includes 2 exercises as well. topics: rhythm, konnakol Level: basic Instruments: for all instruments Duration: 9 min For a list of all my video lessons go here. You could also use the tag cloud (in the footer area of this website) in order to look for video lessons. All German-speaking viewers may have a look at my translation page.